Announcing a new meditation drop in night in Queens New York City, starting Sunday March 25th at 6:30 pm (EST). Starting Sunday night March 25th, we are going to be starting a drop in at our home in Kew Garden Hills, Flushing, Queens, New York City. Please e-mail me to join in. This is intended to be a weekly sit, come once, come often. If you live in a neighborhood near Kew Garden Hills, please come: Briarwood, Flushing, Jamaica, Jamaica Estates, Forest Hills, Rego Park, Pomonok. You may even travel further, there is parking on the street, and mass transit available. You may come from where ever you want! 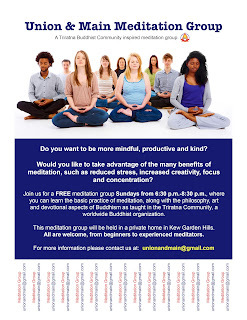 Please come and meditate. Here is a google map of Union Turnpike and Main Street in Queens, New York City. This is near where I live. We plan to gather, meditate, and then discuss the dharma. That may include listening to speakers, audio talks, reading, reporting in, and anything else that advances our practices. You can just be curious about Buddhism, you don't have to be a committed Buddhist. What ever the group wants, as long as it builds sangha and our practices. Please come if you think this would be useful for you, and you feel you would be a positive addition to this group. 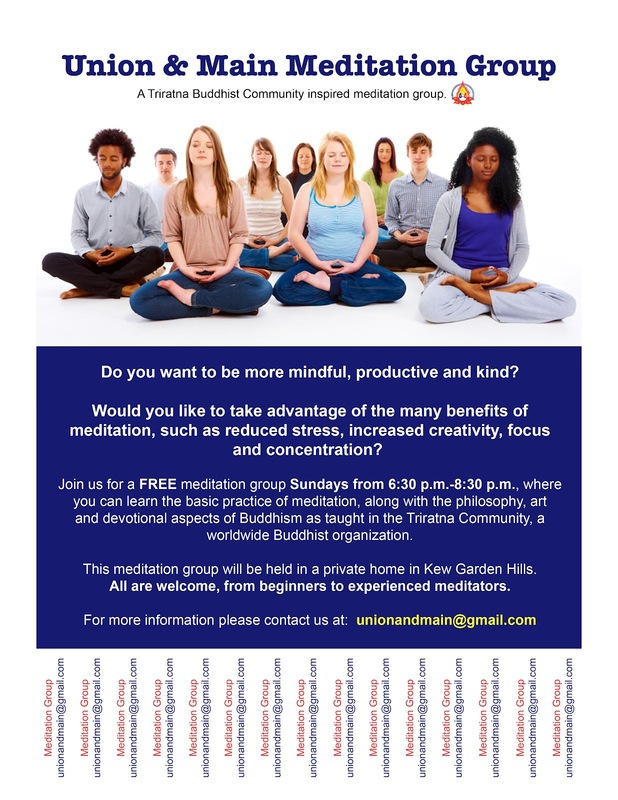 It will be Triratna Buddhist Community inspired group. While I am not yet ordained into the order, I have been in the ordination process for many years, and feel I could facilitate and lead a meditation drop in based on the vision of the TBC. My preceptor agrees, and has suggested the drop in, and I'm following through on a dream I have had for a long time. Please come, and invite anyone you think would benefit from this.